A Paddleboarding Muralist Painted a Warning on a Melting Iceberg #ArtTuesday « Adafruit Industries – Makers, hackers, artists, designers and engineers! At the crack of dawn across the arctic waters of Baffin Island, the Hawaiian artist known for painting environmentally-friendly waterside murals from the balance of his paddleboard, Hula, a.k.a., Sean Yoro goes to work nailing down an acrylic sheet on the face of a melting iceberg. 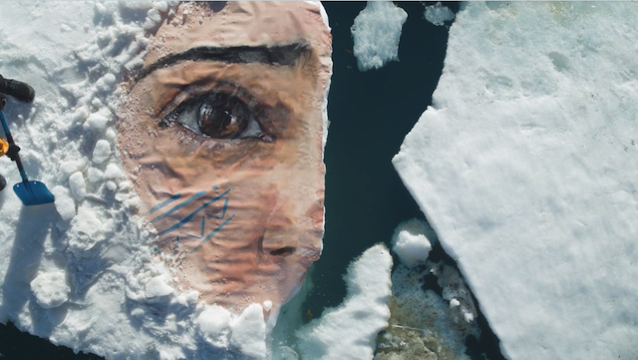 In the nine-minute, What If You Fly, a short film produced by the Camp4Collective the artist travels to Nunavut, Canada to paint a portrait of an Inuit woman. The documentary chronicles Hula’s race against the tide and the melting ice as he embarks on one of the most technical projects of his career. The subject of Hula’s mural is local woman named Jesse Mike, who lives on Baffin Island with her daughter. In the film, Mike says that people seem more concerned with polar bears than the people currently being affected by melting glaciers. When it comes to the subject of rising sea levels, “Let’s make it about the people,” she says. After a 14-hour day of scouting and chasing the tide around in search for that the perfect icy canvas, Hula and his team find their melting sheet and camp out on the ice. To use a reference, the artist snaps a photo of Mike with his camera and traces her outline on a tablet. As night turns to day and the block of ice slowly begins to disintegrate, his speed and precision are put to the test as fights to get as much of the mural finished before it’s too late.